The power of Twitter, it really is amazing. Our very own Boston Bruins saw this first-hand Wednesday night, as they reached global popularity on social media. Not one, but four of Twitter's most popular worldwide trends on Wednesday were associated with the Bruins. 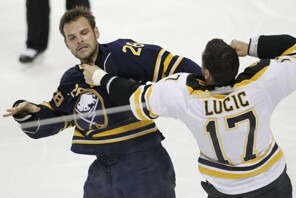 The media-hyped controversy over the hit by Boston's Milan Lucic on Sabres goaltender Ryan Miller 12 days ago lead up to hockey theater on Wednesday night in Buffalo. As soon at the game started, Twitter was flooded by people weighing in on their thoughts on the game. The result: instant exposure for the Bruins. From a marketing standpoint, this is priceless. Having the Bruins trending on Twitter creates excellent international exposure for the brand, and at a minimal cost to the franchise. This right here is the power of Twitter, keeping an entire network of social media users in touch with the Bruins' product, and reaching out to new potential fans. So just what were the four Bruins-related trends topping Twitter's worldwide list on Wednesday? The first two occurred during the game, and were the expected hashtag "#Bruins" followed by the surprising hashtag "#dontpokethebear". The last two trends were not hashtags, and occurred immediately following the game. They were of course "Tim Thomas", and unexpectedly followed by, that's right, "Jack Edwards". For those of you wondering what in the world a hashtag might be, all you need to know is that it's just a small example of the undeniable power of Twitter, and the ever-changing medium it represents. For years, the sports business industry has had a unique opportunity to adapt and embrace social media. There is still more work to be done, and more potential for sports franchises to market their brands. Social media has been, and will be the new way of marketing. And it is not going anywhere.